One of the most enjoyable natural materials to work with is earth plaster (which is also referred to as mud plaster and clay plaster). It is also known as mud plaster and clay plaster. The material is as simple as the name implies. 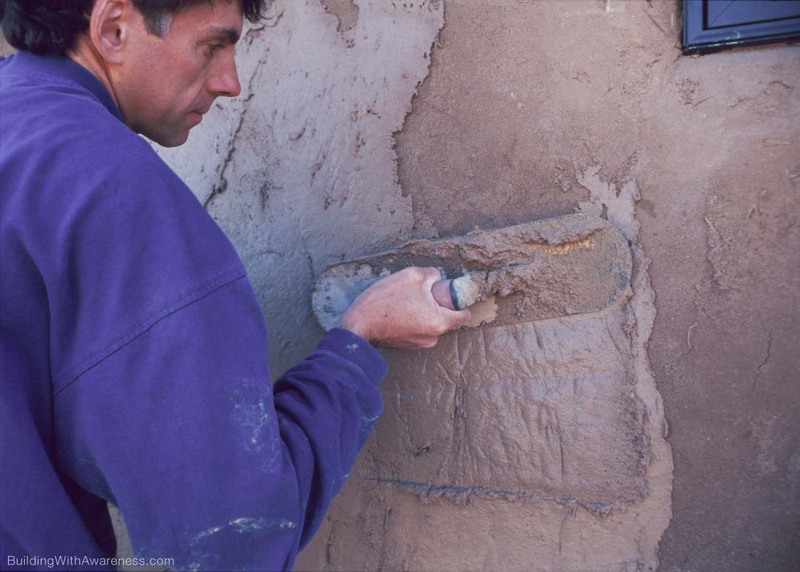 Earth plaster is nothing more than sand and clay (with chopped straw, if desired) mixed together in the proper proportions to prevent cracking. When mixed and applied properly, this wall covering will be hard, durable, and beautiful. In many regions of the country, earth plaster can even be used on the exterior walls and may easily last for seven to ten years or more without any maintenance. One advantage of earth plaster in a natural hybrid home is that the color of the plaster itself can eliminate the need for any paint. This is good for the environment and can reduce construction costs. Earth plaster walls can be made in almost any color you desire. Even white walls are possible. For color tints, natural pigments can be added to the white plaster, and a range of colors can be created from yellow to red to green. In a natural hybrid home such as this, the wall finish is a major visual attribute to the overall look of the house. The earth plaster walls have a rich patina that is not possible with paint alone. The material is breathable, unlike many paints and stucco. This is ideal for straw bale construction in that moisture from within the walls can evaporate out. Breathability is important in any wall system, and particularly important when building a straw bale or adobe home. The material is also easy to apply by beginners. This is especially true for the initial coat, and for my home an all-volunteer crew was used to apply the first inch of mud to the walls. Earth plaster can be applied directly to the straw bales (code permitting). The fibers of the bales create a very strong bond with the mud, and stucco netting is neither necessary nor desirable. It is unfortunate that some codes still require wire netting on the bales. Although earth plasters can be very durable, you will not want to use them indoors where direct water contact will be probable. The walls in direct proximity to sinks and showers should be coated with tile or a water-resistant plaster such as lime. 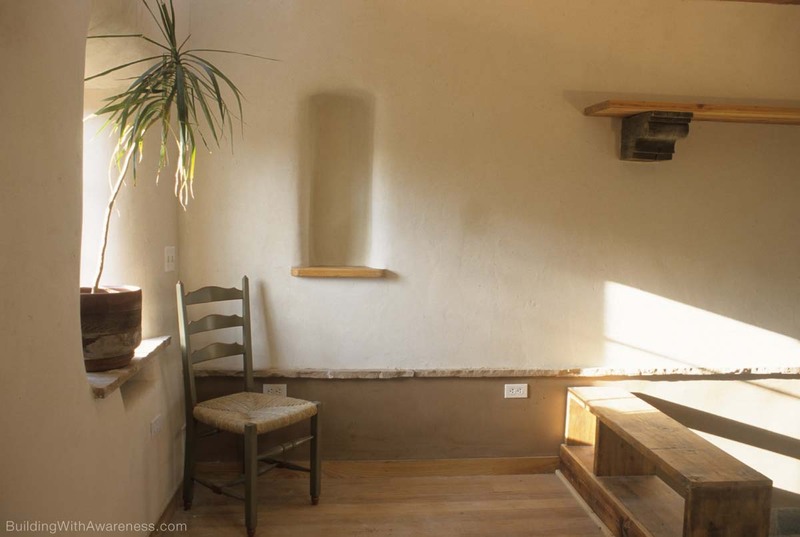 This straw bale home used a three-coat system of applying the earth plaster for the straw bale walls. Two coats were used for the adobe walls. For the straw bale walls, the first coat was quite thick (around an inch). This coat filled in all of the irregularities of the straw bale wall. The second coat was used to even out any undesired undulations in the first coat. The final coat was just a skim coat to add the desired color and texture. On a couple of walls, the final skim coat was gypsum plaster. This was used in areas where more durability was desired. Remember that a gypsum-based plaster has a short working time before the plaster sets. Once set, you can no longer smooth it out. Earth plasters, on the other hand, can be worked for days. This is quite an advantage for the do-it-yourselfer, and you will be able to work at your own pace to create the desired finish. Sometimes it is desirable to have a lighter color wall than the natural brown of conventional earth plaster. This helps to reflect more light around the room. On this two-toned wall a thin coat of white earth plaster has been applied as a finish coat to the brown mud plaster. In two days , an all volunteer crew mixed and applied the first coat of mud for this home. The premixed clay and sand is sifted to remove pebbles. (This premix was purchased from an adobe supplier; you can also mix your own.) The sifted mix is then shoveled into a large cement mixer, followed by a couple of handfulls of dry chopped straw and a bit of powdered wheat paste. Wheat paste is the secret ingredient that makes the mud more water resistant and prevents dusting (clay dust sticking to your hand when you touch the wall after it is dry). All of the ingredients are thoroughly mixed in a dry state before adding water. Now we are ready to trowel the mud onto the walls. With 20 helpers, a lot of mud can be applied in just a couple of days. The process is fun, easy to learn, and the community effort adds to the enjoyment. In addition, the surface of these interior mud plastered walls will look great for decades. Despite this fact, many people consider mud and straw to be insubstantial materials. Why is this? It seems like the more we process a material, the more we accept it. Remove any tell-tale signs of its origin, and most of us are more comfortable buying and using it. This not only permeates construction, it is even accepted in the food we eat. For example, highly processed ingredients, stripped of their naturally occurring nutrients (and original flavor), are in many of our basic foods. Loaded with processed flour, corn syrup and trans-fats, modern food has a longer shelf life, but our own lives are shortened as a result. And when selecting construction materials, we do not question glass windows or fiberglass insulation that is made out of melted sand (silicon). Cement is a highly processed natural material (limestone), and even a wooden 2×4—which has little resemblance to a tree once the bark, needles, and leaves are removed—is perfectly acceptable. Yet straw, adobe blocks, earth plaster, and other materials are often viewed by the general public as not being substantial enough. Materials that can decompose back into the earth without any ill effects are not trusted. Yet this is how nature designed everything: that there be no waste in natural systems, and that everything eventually goes back into the environment for later use. I once spoke to a building-product manufacturer that said his product would last for 1,000 years. I thought to myself, “How many buildings are worthy of lasting 1,000 years?” The reality is that the structure may last for 50-75 years, and then be torn down because the structure was not adapted to a new use. The demolition waste then sits around for another 1,000 years. Is this what we need? It seems that the ideal material will last as long as desired, and then dissolve back into the earth at the appropriate time. We are researching the building os a straw bale home in the forest of western Montana. Having lived in an adobe home in New Mexico I an not excited about the prospect of living in another stuccoed home. I was considering either a slab wood board and batten or metal siding on th e out side and sheet rock and exposed wood on the inside. Has anyone done this and is there any thing special that needs to be planned for? Does earth plaster live long for moonsoon region?? I am looking to make my adobe walls white and wanted to use mud plaster. I am not sure what you mean by white earth plaster. What exactly is that? Where do you get ‘white earth’ as apposed to regular brown earth? Can you mix plaster with mud to make it white? I am also wondering about the dust. I wanted to somehow seal the walls so they aren’t constantly shedding dust. Would regular plaster help? Thanks. White earth plaster and mud plaster are the same thing. Pure powered white clay can be purchased from ceramic supply stores that cater to artists who works with clay and ceramics. Wheat paste is added to the mixture to prevent it from chalking or dusting when touched. Our “Building With Awareness” book and DVD video goes into detail regarding mixing, proportions, and application methods.